The global anesthesia gas blender market is likely to witness a fragmented competitive scenario all over the world, due to presence of numerous key players located in different regions. There are various small players present in the global anesthesia gas blender market, which are estimated to eat up the profit shares from the big vendors in the market. Some of the important players in the global anesthesia gas blender market are HEYER Medical AG, Medical Innovations GmbH, Farstar (Wuxi) Medical Equipment, Armstrong Medical, EKU Electronics, Becton, Dameca, Dickinson and Company, Heyer Aerotech GmbH, Smiths Medical, and flow-meter S.p.A. These players are indulging themselves into mergers and acquisitions, so as to maintain their market position and improve their foothold in the regional market and industrialization in the developing nations in the world. According to a recent report by Transparency Market Research (TMR), the global anesthesia gas blender market is prognosticated to expand at a steady CAGR of 5.8% within the forecast period from 2017 to 2025. In 2016, the global market was valued around US$400.3 mn, which is expected to soar around worth of US$663.3 mn by the end of 2025. On the basis of technology, the global anesthesia gas blender market is bifurcated into dual tube flow meter and tube flow meter. Among these two, the dual tube flow meter segment led the anesthesia gas blender market, back in 2016. This is attributed to the better accuracy, efficiency, and reduced energy consumption. 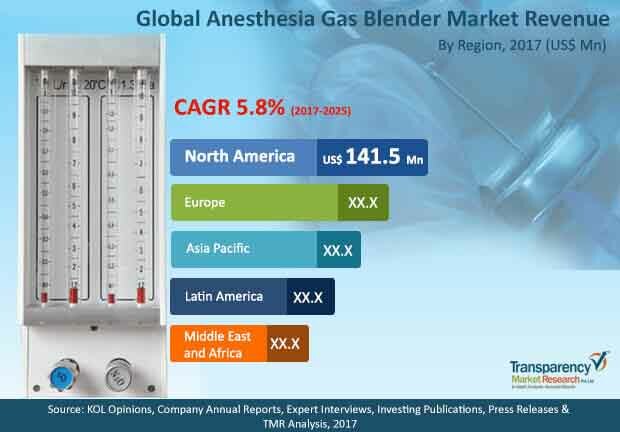 Geographically, in 2016, North America accounted for the biggest market share for global anesthesia gas blender market, due to rise in demand from ambulatory services and hospitals. However, alterations in policies and legislations, implementing new tax reforms, along with the rapid increase in medical tools is one of the hindering factor for the market growth during forecast period from 2017 to 2025. There exist several factors driving the demand for anesthesia gas blender in the market. They are used extensively in many medical devices and surgical process. Additionally, the notable increase in the mortality rate due to incorrect administration of anesthesia to the patient, has accelerated the need for anesthesia gas blender, since past few years. The anesthesia gas blenders are also of high importance for the newborns or neonates during delivery, where the precision d accuracy is must and very crucial. So in general, the need for anesthesia gas blenders to administer calculated and exact amount of anesthesia to the person undergoing a certain surgical procedures has as well fuelled the market growth of synesthesia gas blender market. Along with that, the rising cost with respect to healthcare sector in developing regions with the surge in medical tourism are some more factors boosting the demand in the forthcoming years. The notable increase in the mortality rate due to incorrect administration of anesthesia to the patient, has accelerated the need for anesthesia gas blender, since past few years. The rising cost with respect to healthcare sector in developing regions with the surge in medical tourism are some more factors boosting the demand in the forthcoming years.